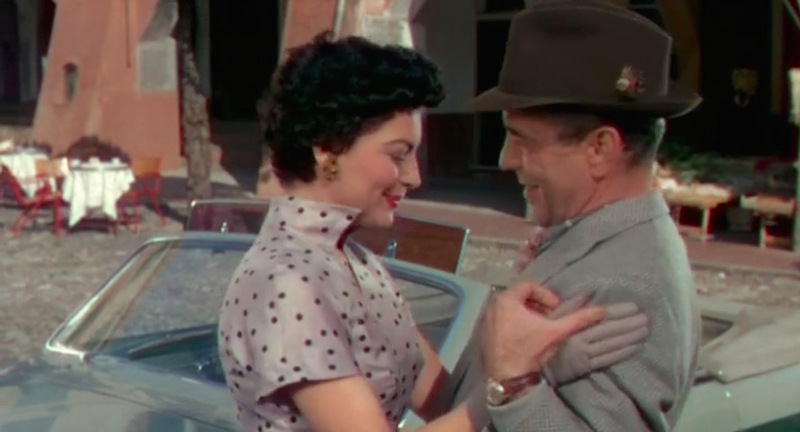 Humphrey Bogart’s role in United Artists’ 1954 Technicolor triumph The Barefoot Contessa was not dissimilar to the film’s director, writer, and uncredited producer Joseph L. Mankiewicz, who had been writing in Hollywood for a quarter century. 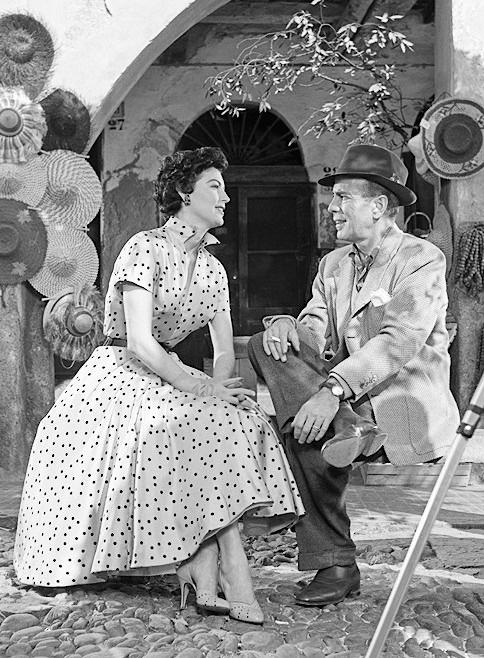 Mankiewicz had just celebrated back-to-back Oscar wins for both Best Director and Best Screenplay for A Letter to Three Wives (1949) and All About Eve (1950) and was at the top of the Hollywood game at the time The Barefoot Contessa was produced in 1954, providing Ava Gardner with one of her signature roles and establishing a glamorous tribute to Technicolor and the waning years of Hollywood’s golden age. Bogart’s Harry Dawes had been absent for a while by the time he catches up with Maria Vargas (Gardner) in the Italian coastal town of Portofino, itself emerging as a popular vacation spot for Bogie and his wife Lauren Bacall, who had accompanied him to the city during the production. Approximately two years had passed since Harry first met Maria in the back room of a Madrid nightclub, but it’s only been six weeks since Maria met the smooth Italian count she now plans to marry. 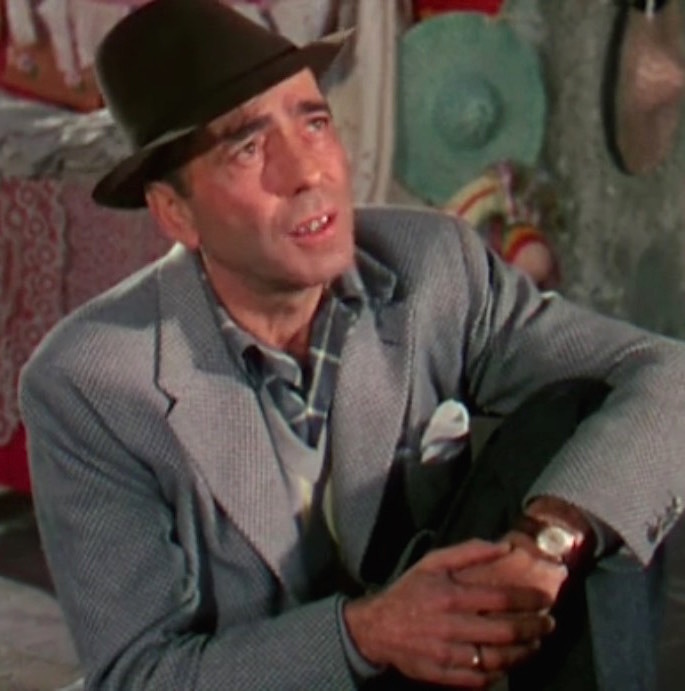 Harry Dawes’ sartorial approach for the first half of The Barefoot Contessa mirrored that of Humphrey Bogart in real life, consisting of full-fitting fifties suits and sport jackets with natty bow ties. However, Harry has considerable loosened up by the time he visits Maria in Italy, and his daily dress is now exclusively casual with v-neck sweaters and open-neck shirts. For his reunion with Maria on the streets of Portofino, Harry wears a colorfully layered ensemble anchored by a light wool sport jacket in a gray-on-light gray geometric basket weave pattern that resembles a mini-check. Like much of Humphrey Bogart’s on-screen wardrobe, the jacket appears to be part of his real life collection, as this photo from early 1949 after the birth of his son Stephen suggests. The single-breasted sports coat has notch lapels that roll to a three-button front, which Harry wears both open and with the center button fastened. The shoulders are wide and padded in accordance with the decade’s trending fit, and the sleeves end with four buttons on each cuff. The ventless jacket has large patch pockets on the hips and a squared patch pocket on the left breast, where Harry keeps a white linen pocket square loosely tucked. 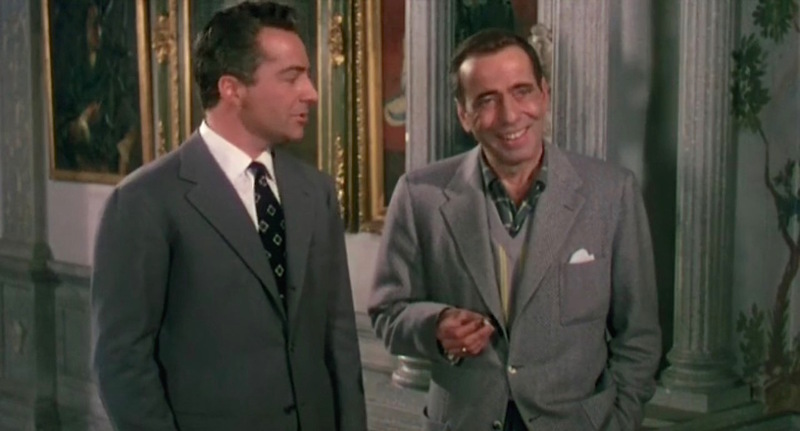 Count Vincenzo Torlato-Favrini (Rossano Brazzi) makes the acquaintance of Maria’s old pal, Harry Dawes. Harry’s casual American attire provides a sartorial contrast to the continental count, who is always composed in a fashionable gray suit and tie. Under his jacket and his sweater, Harry’s shirt is barely seen but the bold slate blue color makes a big impression and helps what little is seen of the shirt pop. The shirting has a thick white windowpane check. Likely a casual long-sleeve sport shirt, the shirt has a large point collar and is worn unbuttoned at the top. Note the subtle basket weave pattern of Harry’s sports coat and compare it to the bolder, stronger windowpane check of his shirting. Harry’s intermediate layer between his sports coat and his shirt is a light gray knit long-sleeve V-neck sweater with double sets of yellow vertical stripes. Harry wears a pair of dark gray flannel trousers with a then-fashionable full fit, finished with turn-ups (cuffs) on the bottoms. No belt is seen under the buttoned jacket or the hem of his sweater, but we can assume that his belt – if he is wearing one – would be brown to coordinate with his footwear. His shoes are walnut brown cap-toe slip-on loafers with short elastic side gussets, worn with dark gray socks that continue the leg line of his trousers into his shoes. 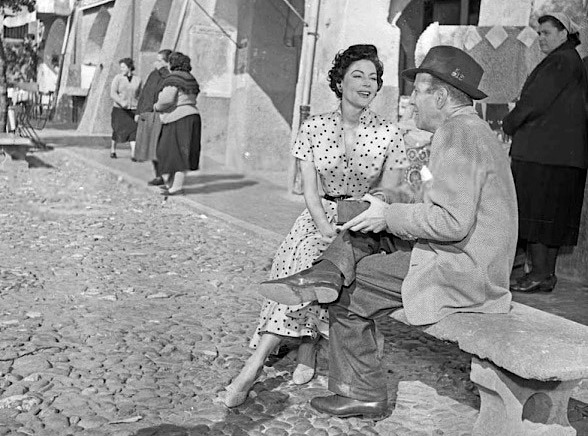 Ava Gardner and Humphrey Bogart on location in Portofino, February 1954. While Harry’s solid-colored suits and bow ties loosened up to patterned sport jackets and open-neck shirts by the end of the story, he always wears the same hat, a short-brimmed brown felt fedora with a narrow band and a feather on the left side of the crown. Harry eagerly catches up with Maria. 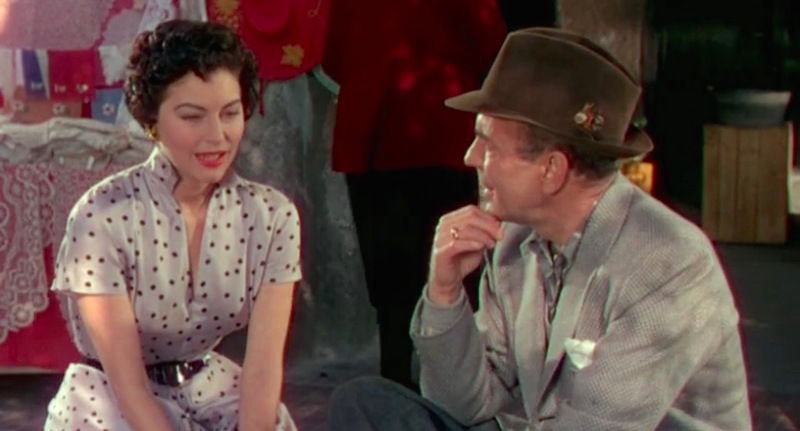 If I were having a conversation with Ava Gardner, I’d probably be hanging on to every word as well. 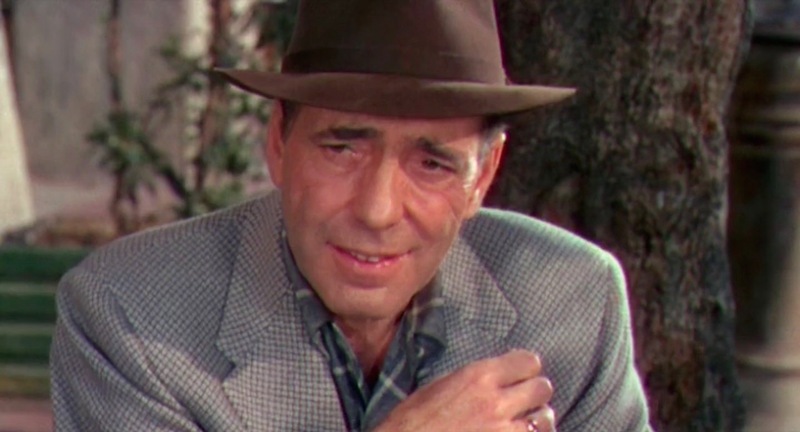 The ring on Bogart’s third finger of his right hand is his usual gold ring with two rubies flanking a center diamond. On the opposing hand, he wears a gold wedding band that symbolizes Harry Dawes’ happy marriage to Jerry (Elizabeth Sellars). The small watch on Harry’s left wrist is yellow gold with a gold dial and a russet brown leather strap. Based on the size of the small round case, it does not appear to be the tonneau-shaped Longines Evidenza that has been identified as one of Bogie’s real-life timepieces that frequently made its way into his movies. Maria and Harry reunite in Portofino. 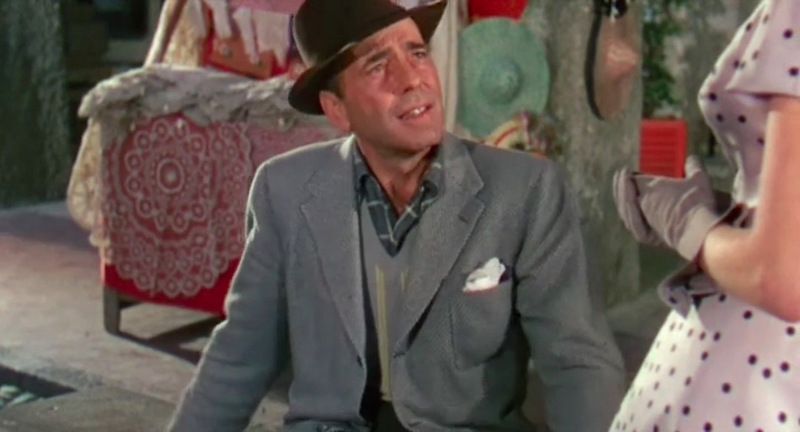 Humphrey Bogart brought his own sartorial tendencies to his roles, and The Barefoot Contessa was reflective of Bogie’s own early ’50s aesthetic, including this casual and comfortable patterned ensemble of a sporty jacket, sweater, and shirt topped off with a short-brimmed fedora.